Since Tom Brady, the New England Patriots have been the model of success in the NFL, putting together double-digit regular-season win totals in all but one game since 2001. The franchise has claimed four Super Bowl wins over that span, and they are without a doubt the best team of the last decade-and-a-half. However, the Patriots once again failed to reach their ultimate goal of winning a Super Bowl title in the 2015 season. Here are the three worst mistakes that led to their undoing in the playoffs. For the most part, the New England Patriots have never truly possessed one of the league’s better running games — outside the days with Corey Dillon. The absence of a rushing attack was quite evident in 2015 as they ranked 30th in the league with 87.8 yards per game and tied for third-fewest yards per carry (3.7). Although the Patriots’ offense features a heavy inclusion of the passing game, their lack of consistent success on the ground didn’t provide them fluidity on that side of the ball. Much of their lack of effectiveness in the running game could be directly tied to the fact that they lost one of their spark plugs, Dion Lewis, midway through the season. From that point on, the team depended on LeGarrette Blount to carry the primary duties, but he suffered a season-ending hip injury late in the season. This left the Patriots scrapping for help in the backfield heading into the playoffs, leading them to sign Steven Jackson, who has been a shadow of the player he once was over the last few seasons. This placed more pressure on Brady to lead the charge with his arm and essentially make the offense solely dependent on the passing game. In the AFC championship game, this happened again as Brady threw the ball 56 times compared to just 17 plays where they ran the ball. This included the 38-year-old being the team’s leading rusher with 13 yards. If the Patriots had any essence of a running game in the playoffs, it could have been what lifted them over the top. Through their long run of success over nearly the last two decades, the Patriots have often fielded one of the better offensive lines in the league. Their best offensive linemen help keep Brady upright, allowing him to put together some of the most productive seasons in NFL history. The two-time league MVP was able to post one of his better campaigns, leading the league with 36 touchdown passes despite some questionable play regarding their offensive line. The Patriots’ offensive line struggled to some degree in pass protection, giving up the 12th most quarterback hits (97) and 14th most sacks (38) in 2015. 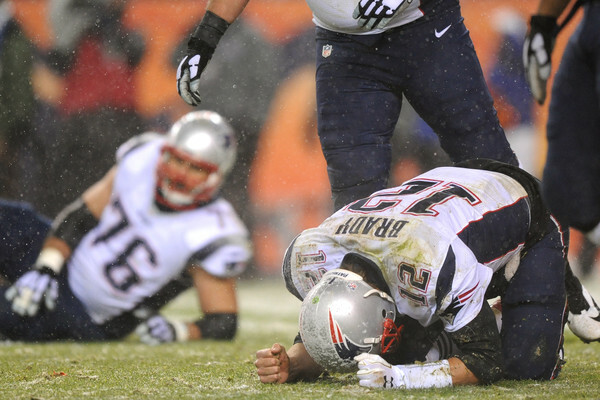 This was on full display in the AFC championship game against the Denver Broncos as Brady was hit a season-high 23 times and sacked four times. It helped contribute to their quarterback recording his first career game where he completed less than half of his passes and threw multiple interceptions. Brady was somehow able to force overtime in a game dictated by Denver’s dominant pass rush duo of Von Miller and DeMarcus Ware. The Broncos may have fielded one of the best defense in league history, led by their impressive defensive line, but this shouldn’t shield the fact that the Patriots need to upgrade their offensive line. They haven’t truly addressed that area over the last four years (electing not to use a pick in the first three rounds of the draft over that span). The bottom line here is that New England needs to upgrade their offensive line pronto, especially with an aging quarterback in Brady. With how things unfolded in the fourth quarter of the AFC Championship game, we question Bill Belichick’s two decisions to go for it on fourth downs from inside the Broncos’ 30-yard line — instead of settling for a pair of field goals, which may have resulted in a different outcome for the game. In that situation, the Patriots were down eight points midway through the fourth quarter, and the Broncos wanted to milk the clock down. Meanwhile, it was clear that New England had the momentum moving the ball down the field. If they had attempted the field goals, it would have only required Brady to get into field goal range on the final drive. As it turned out, he led the Patriots on a quick drive that lasted under a minute and 40 seconds, going 50 yards on eight plays. Obviously, there’s no guarantee that all of this would have transpired if the Patriots chose to take the two field goals, but it would have given them a much better chance to win the game.